Dan Biggar says he is humbled after being named players' player of the year in the Pro12 end-of-season awards. 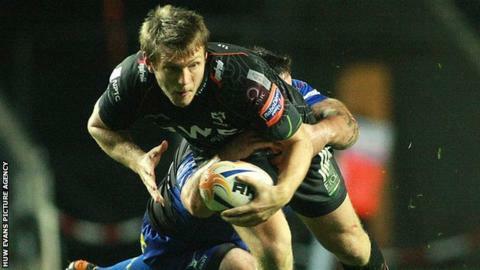 But the 24-year-old Ospreys fly-half says he would trade the award for a place in the play-off semi-finals. "It is very very humbling to be fair because the league which we play in is full of superstars of the game," Biggar said. "But there is a slight disappointment that we didn't get into that top four as a team." Biggar was the top scorer in the regular season, notching 219 points. And he blamed inconsistency for the Ospreys' failure to make it into the top four at the end of a difficult season. They were the highest placed of the four Welsh regions, ahead of the Scarlets, Cardiff Blues and Newport Gwent Dragons. But Biggar said the four-times champions were bitterly disappointed not to make the play-offs. "It's nice to have an award but I certainly would have traded that award for a place in the semi-final or final," added Biggar. "We haven't gone that badly as a team. "We've got a great pack which allows me to work behind a bit of a platform and keep the scoreboard ticking over, but we've lacked any consistency in the team and we haven't had any momentum." However, the award capped a season which has seen Biggar fight back from the disappointment of missing out on the British and Irish Lions tour of Australia. He was also beaten to the Wales number 10 shirt for the opening 2013 autumn international by Rhys Priestland. The Scarlets fly-half was also selected ahead of Biggar for the first four games of the 2014 Six Nations championship, before the Osprey got the nod for the record-breaking 51-3 win over Scotland. Biggar says the key to his resilience is not dwelling on set-backs. "Dealing with the good times is easy, it's all about how you deal with set-backs and disappointments," he said. "My motto has always been 'it's out of your control, someone else is picking the side'. "All you can do is knuckle down, do as much work as you can and try to prove people wrong or just keep doing your best and that's all I've done really. "I haven't got carried away worrying about [whether it] is the end of the world if I don't get picked for the Lions or picked for Wales. "It's just about working as hard as possible that's always been my motto - certainly not to sulk and feel sorry for myself for days and days. "Get up and do something about it, rather than the opposite of that." With Priestland's knee injury making him a doubt, Biggar is likely to a key member of Wales coach Warren Gatland's 31-man squad who face two Tests in South Africa in June.